Today was the grand opening of our second locally owned food co-op. We’ve been members for nearly all 14 years we’ve lived here. The original store is a 6 mile bike ride. This new store is less than a mile. They announced this location two years ago. Construction started a year late. It’s been a long wait for this opening. With a vegan and a Celiac in the household we buy a lot of our food from the co-op. Notice the carrot shaped bike racks just to the right of the front entrance. I’ll be using that often. The store is called Whole Foods Co-op but has no connection to Whole Foods Market. This one started 46 years ago. Winter storm update. The storm for us next to Lake Superior stayed rain most of the day while away from the lake it snowed all day. By 3 this afternoon it finally switched over to wet snow. We had 2-3 inches of rain overnight. If that had been snow it would have been more than a foot deep. 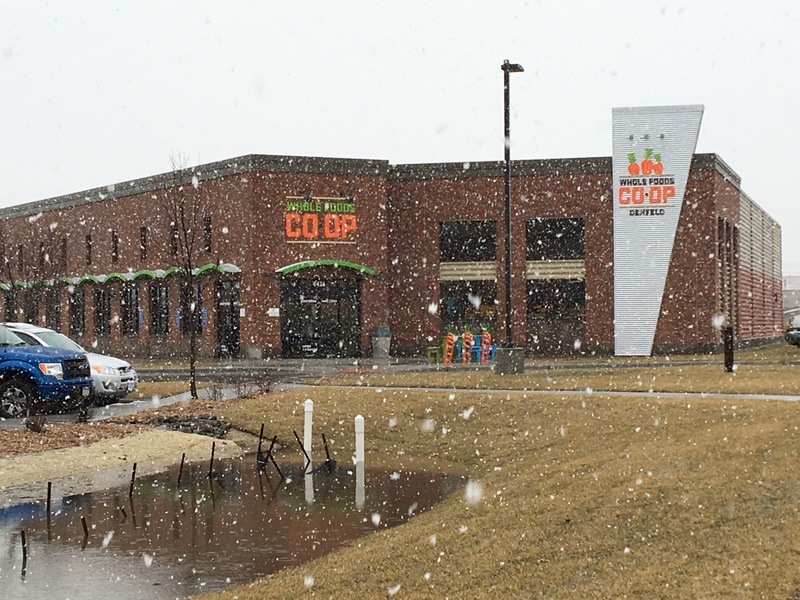 Our new Co-op and a winter storm. It doesn’t get much more exciting in Doug’s world. Haha…I enjoy seeing my friends enjoy themselves. How are those bike racks? I often find the “cutesy/whimsical” bike racks are actually horrible for their intended purpose. While I get the idea of making a bike rack look cool, I’ll take ugly but functional any day. Adequate. Racks in general are still hard to come by in Duluth. For some odd reason when local businesses put in the effort to add a bike rack they seem to think artsy is the way to go. It’s like they think a bike rack is unsightly unless they go all artsy.